Android smartphones can do a lot of things that can help you increase your productivity. You can use To-do list apps to keep track of tasks and to-do list for the day; you can use note taking apps to take notes on the go, add images, draw a doodle, and other stuff without having to use more sophisticated apps like the MS Word on your laptop or PC. Apart from this, there are a lot more apps for Android that can help you organize your work and increase the productivity. In this article, I have listed the best productivity apps for Android that you should know. 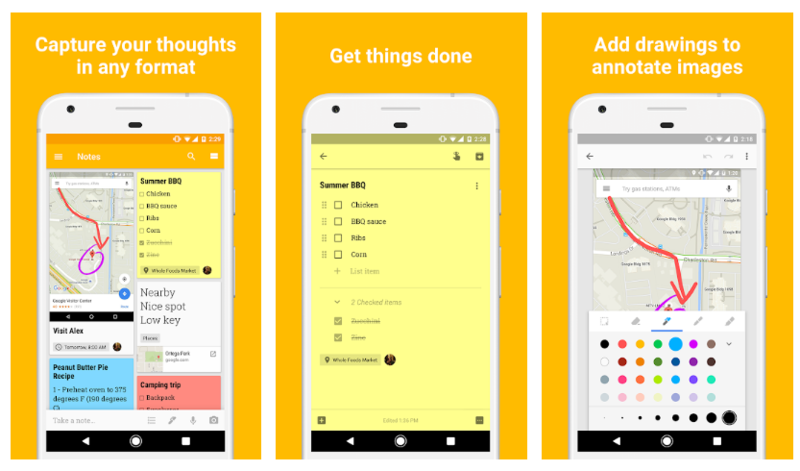 Google Keep is a note-taking app, and there is no reason to oomit Evernote and Microsoft OneNote from the list. All the three apps are popular for their note-taking ability. You can add voice, image and text notes. Add and share to do list and assign a task to any other user or group. These apps mostly are cross-platform so synching between the devices is easy. While the Evernote needs you to go premium for additional features, Google Keep and OneNote offer everything for free except the limited 5 GB and 15 GB of storage space. 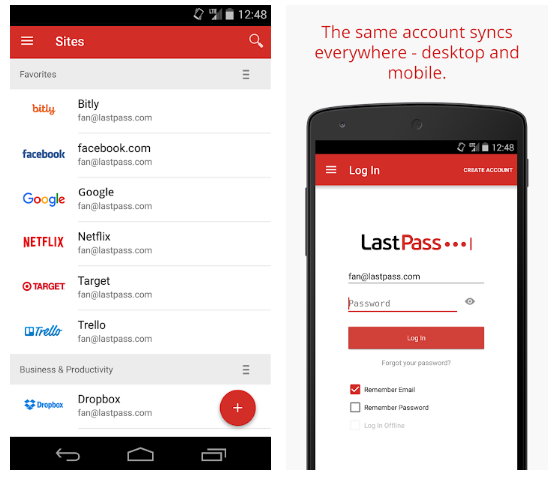 LastPass is a password manager as the name suggest, and it is one of the best password managers for an Android phone. The application is also available on other platforms including the Windows and iOS. Coming to the use, LastPass stores all your password for different accounts securely so that you don’t have to remember all the passwords or risk forgetting the password. It is also a security feature because usually, people try to use one single password for all the services they use so that they don’t have to remember multiple passwords. But, this is a security risk. LastPass makes it easy for you to manage all your password in one place. LastPass comes in two version, free and Paid. The paid one offers more features but costs $12. If you don’t need the premium features, the free version covers all the basic needs of an end user. If you are using Microsoft office suite on your Windows PC, then you also like it on your Android smartphone. 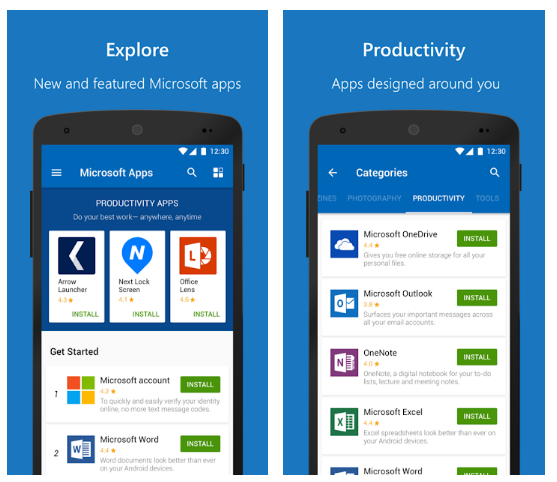 Microsoft Apps is nothing but an App Store for Android smartphones that lists all the Microsoft Apps available for your smartphone. It comes with a number of productivity apps including OneDrive, Cortana, OneNote, Outlook, Excel, PowerPoint and MS Word. All the apps are not installed along with Microsoft Apps, but the users have the option to download any Microsoft apps you want manually. All the installed Microsoft Apps are accessible within the Microsoft Apps app. You can use the Microsoft Remote Desktop app to control your Windows PC using your Android phone. If you are into Microsoft Apps, you should give this app a try. 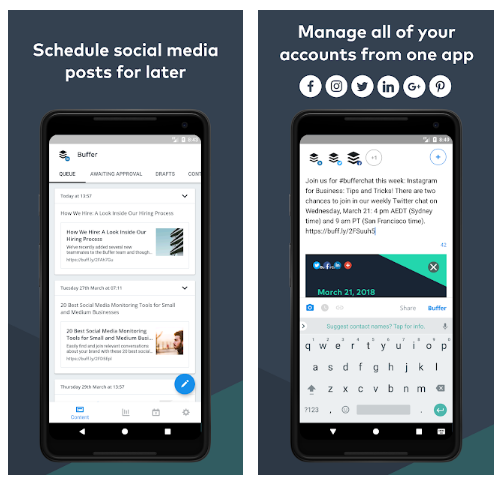 Buffer a social media account managing app that allows you to manage multiple social media accounts or just different social media accounts from one place with ease. You can share anything on multiple platforms, and supported platforms include Twitter, Facebook, Flipboard, UberSocial, Plume, Evernote, Pocket, App.net, Google and more. You can also schedule posts based on time and date. What’s more? The app also has analytical reports that shows you how well the post or tweet performed in each of the social media accounts. While the Android device comes with an integrated email client where you can configure all your email IDs, it is still not as good as some of the third-party email managing clients are. 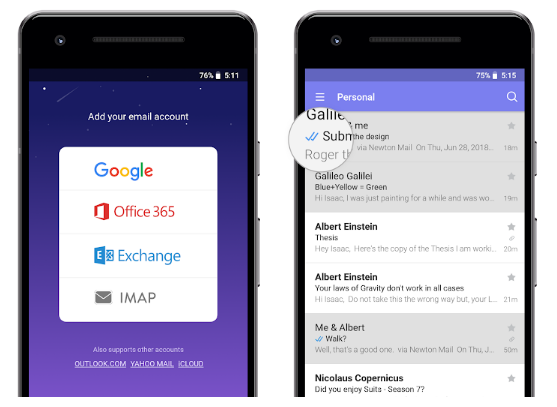 Newton Mail is a popular email app available for Android. It supports all the major email services including Gmail, Hotmail, and Yahoo. You can integrate with other services like Evernote, Todoist, Pocket, and others such apps using the plugins. Newton Mail comes in free and paid version. If you want anything more than that the free version offers then the paid version is a good option. 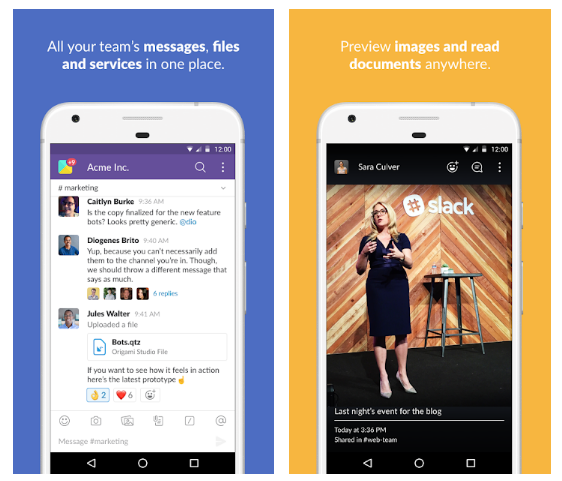 Slack is developed keeping the professional in mind. The app allows the users to communicate with their co-workers through chats or voice calls. You can call or message any person or group within your team, share and edit documents and collaborate with as many as 8 people simultaneously and the best part is it integrates with apps like Dropbox, Asana, Twitter, SalesForce, and Zendesk. The app is best suited for freelancers working from remote areas as it provides a common platform to be online and discuss ideas and assign tasks to the group. The app comes in both free and paid version. For big business, the paid version will make more sense. 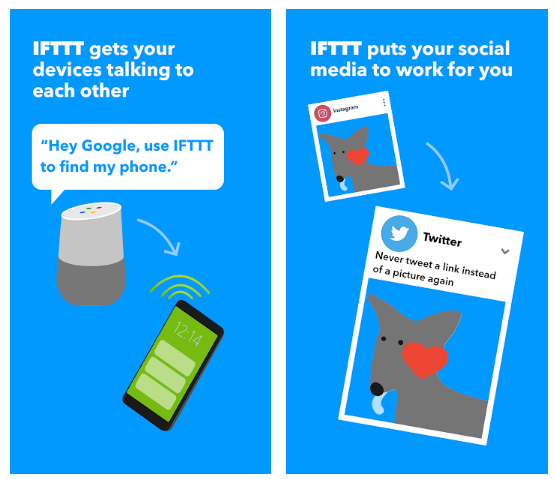 IFTTT (If this, then that) is an interesting productivity app that helps you do daily repetitive tasks automatically. Let’s say you use smart lights at home and you turn them on when you get back home every day. You can make IFTTT automate this task. It can also sync your recently taken pictures with Dropbox or Google Drive account if you want. The small commands are known as applets. While the app comes with its own set of applets, you can create new applets based on your needs. It works well with Amazon Alexa and Google Home. It can give you latest updates from specific publications and can automate anything on your Android phone or smart in your home. The app involves a learning curve, but once you get used to it, it can surely make your life more productive. Tide is based on the popular Pomodoro Technique where the user works for 25 minutes and takes a break of 5 minutes. The technique is helpful if you get too distracted from work due to one or other reason. Tide has incorporated the technique into its app, and it does the job most of the time. You can also customize the timer settings based on your work type. 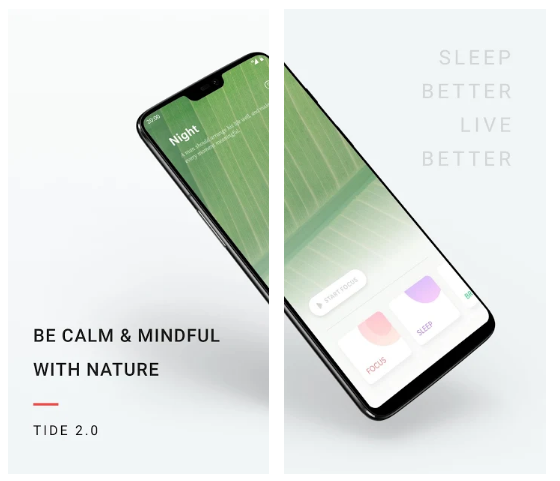 The app also has a number of ambient noises that can help you relax or meditate or sleep if you have difficulty sleeping. With Immersive Mode on the app will prevent the user from using any other app on the phone thus helping you to focus on the work.